I found this picture of Martin Luther King, Jr. on my computer, and for a moment, I was confused. Why did I save this? 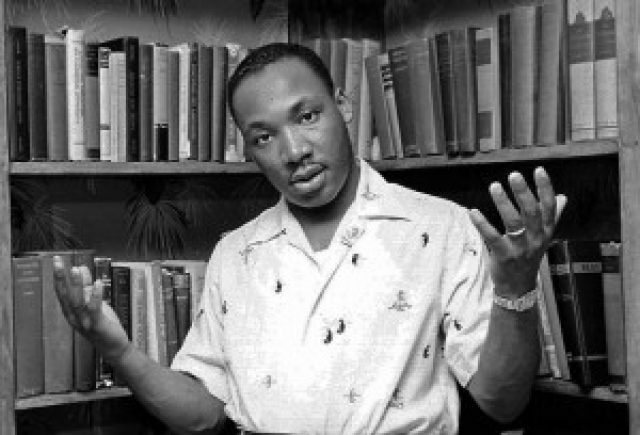 Why is MLK wearing a polo shirt with seahorses on it? Why does he look as out of it as I look in every picture my friends ever take when I’m not expecting it? Then I remembered why I saved it: I loved the relatability of it. King is an icon, a beacon of the Civil Rights movement, an incredibly well-spoken man, someone to look up to…and maybe also a person with a goofy side? For as much as he accomplished, King probably didn’t always have it together. I like to think that even role models like King also sometimes fell short of perfection. Maybe they too ate cold chicken out of the fridge because they were too tired to warm it up. Maybe they too zoned out during a professor’s question and ended up answering with something like, “Sure, that sounds good.” Maybe they too commissioned a button-pushing article about ritzy pizza for their school newspaper and only realized they should question it once the remarks were in print. (I know somebody like that.) Maybe they too slipped on the ice and when they got back up said a tiny prayer of thanks under their breath—not that they weren’t hurt, but that nobody saw the fall. Anyway, maybe these heroes of ours also ran out of quality comical content, so they settled for a lower octane of humor: the dad joke. (I get that these kinds of jokes may not necessarily be told by dads. You might know a brother or a barber or a lady who isn’t actually related to you but you call an aunt because she always shows up for Thanksgiving dinner who use these kind of jokes on you.) So as you contemplate the possibilities that your icons may possess quirks that make them human, enjoy some of these dorky laughs. Q: Did you get a haircut? A: No, I got them all cut. Q: What do a cigarette and squirrel have in common? A: Both are completely harmless until you put them in your mouth and light them on fire.